Here you’ll find select video, audio, and print media about Anne, as well as concise biographical information. In her fourth novel, Anne uses a dramatic setting El Malpais, an extensive lava flow that borders the Ramah Navajo reservation. Add reads a section of the book in this brief video. The Albuquerque Journal gave Cave of Bones a big thumbs up. You can read the review here. And, Anne’s home town paper The Santa Fe New Mexican sat down with her for a little chat. Here’s the interview. Spider Woman’s Daughter is a hit! Spider Woman’s Daughter. The book continues the adventures of Navajo officers Jim Chee and Joe Leaphorn, and gives Officer Bernadette Manuelito a chance to share the spotlight. Check out the book trailer! The book debuted at Number 10 on the New York times Best seller list and has been a popular read. It is also a finalist for the wonderful Dilys Award, given annually by the Independent Mystery Booksellers Association to the mystery titles of the year which the member booksellers have most enjoyed selling. Anne was honored to be featured in the Santa Fe New Mexican, in an Albuquerque Journal book review and a feature article, the New Mexico Review of Books, and the CostCo Connection newsletter. Here’s a feature story from the Albuuqerque Journal. “I was thrilled to get a call from the president of the esteemed group Western Writers of America letting me know that my mystery was being honored with the 2014 Spur Award for Best First Novel. The award is especially meaningful because I know there were many, many fine books submitted for the honor. And because the Spur was among the awards my Dad treasured the most. You can read more here. The Great Taos Bank Robbery, Tony Hillerman’s popular book of non-fiction short stories, has been re-issued by the University of New Mexico Press with a new introduction about her father and his work by Anne Hillerman and new photographs by Don Strel. Originally published in 1973, the book features stories that take the reader from a southern New Mexico missile range to Ship Rock and the Navajo reservation. The book covers topics including an uprising of Spanish land grant heirs, a bank robbery that never happened, the aftermath of Zuni’s sacred Shalako ceremony, and the reasons the Navajo love their arid homeland. Read the review in New Mexico Magazine. Here is a Report from Santa Fe interview discussing Rock with Wings. An interview with Deborah Martinez about growing up as Tony’s daughter, the writer’s life, the challenges of the mystery genre and more. A January 2017 interview with Anne on KJSD. To listen to a Santafe.com interview with Anne click here! Video of Anne speaking at the 2014 National Book Festival in Washington, D.C. Here is Anne talking about Cave of Bones and reading an excerpt. 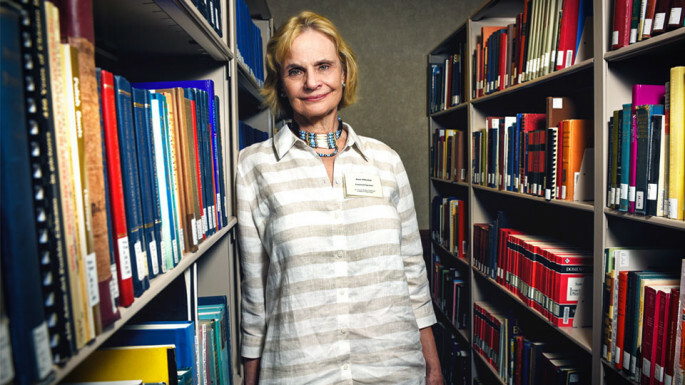 You’ll find a short biography suitable for publication here, as well as color and black and white photos of Anne Hillerman. Sign Up Here for the latest on Anne’s books, signings, presentations and more!